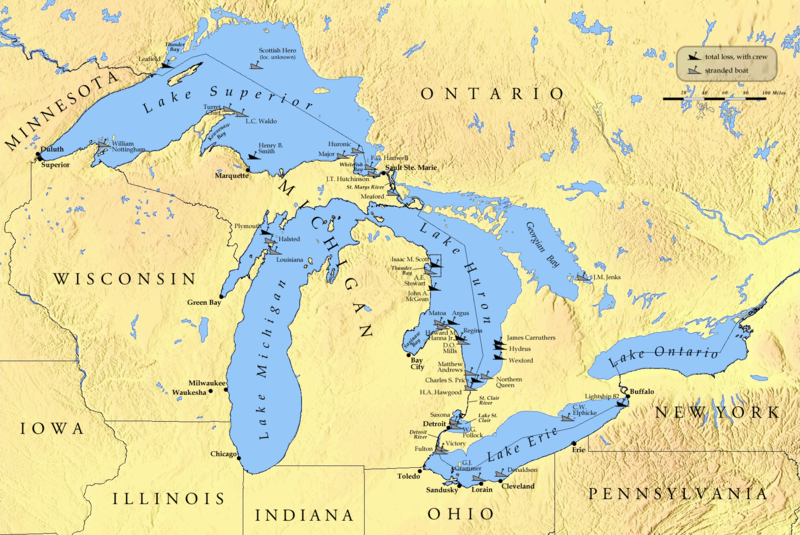 The Great Lakes were almost completely frozen over by March 2, with 90.5 per cent of their total surface covered in ice. The five connected lakes are located on the border between Canada and the United States, in northeastern North America. Although some sections of the lakes freeze each winter, usually only about 50 per cent of the water is covered with ice. In 2012-2013, only about 38 per cent of the lakes was frozen over, and just 13 per cent was covered with ice in the winter of 2011-2012. Scientists say the large amount of ice is due to unusually cold temperatures in January and February. Ice forms when very cold air blows over water and causes the surface temperature to drop to the freezing point. A thin layer of ice forms, and if temperatures remain cold and the weather is calm, the ice will thicken. Windy or stormy weather stirs up the water and makes it harder for ice to form. Ice began forming on the Great Lakes in November. By early March, Lake Superior, Lake Huron and Lake Erie were all 95 per cent covered with ice, and 90 per cent of Lake Michigan was covered. But only 45 per cent of Lake Ontario was frozen over. Lake Ontario is very deep, with a stronger current than the other lakes and with less surface area for heat to escape through, so it takes longer to freeze. The extra ice is causing problems for ships on the Great Lakes. Some icebreakers (ships that smash through the ice to clear a path for other vessels) have been working four times as many as hours as usual so ships carrying essential cargo like oil, coal and salt can get through. Migrating birds that need open water are having a hard time finding landing places and food. But the extra ice also has some benefits. Ice that covers the spawning areas for some types of fish, like whitefish, can help to protect their eggs from predators. That means there could be more fish in the lakes this summer. If the ice lasts into the spring, the temperature around the lakes will remain cooler and there will be less evaporation. This will lead to higher water levels in the lakes, which will allow ships to carry heavier loads of cargo. This is the most ice that has formed on the Great Lakes since 1993-1994 when 90 per cent of the surface was covered, according to the Great Lakes Environmental Research Laboratory. The record ice coverage for the past 40 years is 94.7 per cent in 1978-1979. Time-lapsed photos of Lake Superior freezing over. 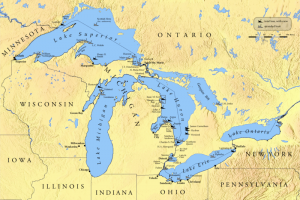 NASA satellite photos of the Great Lakes. Comparison of ice coverage on the Great Lakes, January 2013 vs. January 2014. Today’s article points out that there are good and bad things that the ice coverage may mean. Write your own list of the good and things that may result from lots of cold weather. In the end, were there more positives or negatives. Today’s story can be labelled as a scientific article. What are the elements (parts) of today’s article that make that a fitting description? Read a variety of texts from diverse cultures, including literary texts (OME, Reading: 1.1). Read a wide variety of increasingly com plex or difficult texts from diverse cultures, including literary texts and informational texts (OME, Reading: 1.1). A proper noun is the specific name of a person, place, or thing. Today’s article contains a whopping 18 proper nouns! Find them all and underline them!